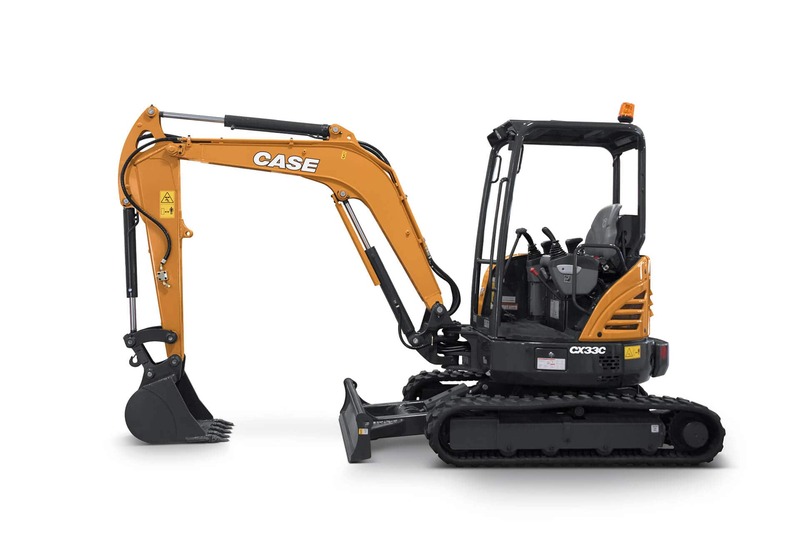 Among the most popular size classes for mini excavators, the CX33C is designed to provide the digging performance (6,900 lbf.) and depth (nearly 10 feet) of a larger excavator while retaining the distinct advantages of a zero tailswing machine. Greater track shoe width improves tractive effort and increases lift capacities, and many of the productivity-boosting features that contractors count on come standard. Other options include a hydraulic quick coupler and steel tracks for even greater bite and performance on rocky or varying terrain. 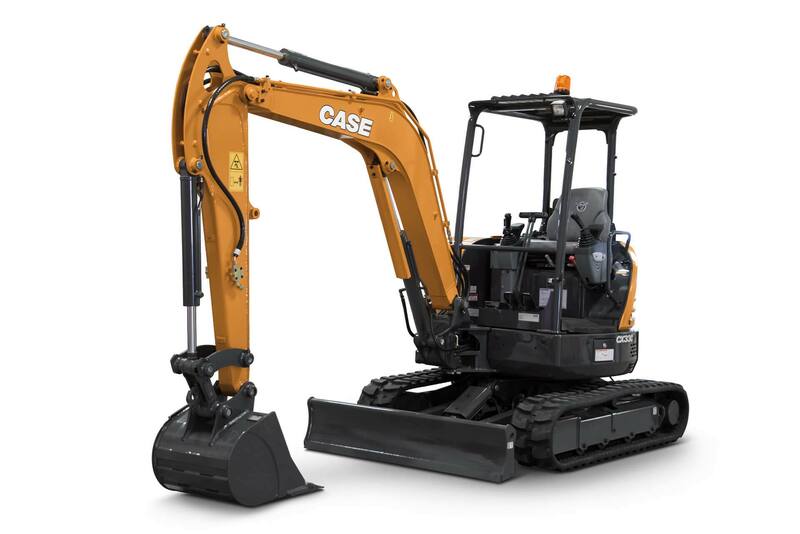 The C Series provides more features and functions that drive productivity than any previous CASE mini excavators. Auxiliary hydraulics allow for easy thumb and attachment setup, Automatic 2-Speed Travel provides smother travel across varied terrain, and a push blade assists in backfilling and improves digging stability – all standard. 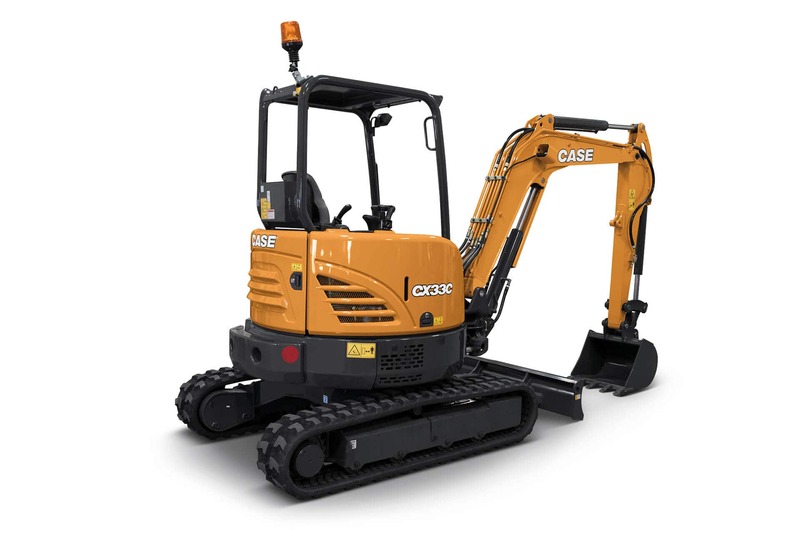 The adjustable boom can be offset to either side, which combined with a zero tailswing design, allows the CX33C to dig alongside buildings or in confined areas without fear of damaging the machine or environment. Plus, at just under 7,400 lb., the CX33C is capable of being transported without special licensing or towing equipment* making it a powerful and simple addition to any fleet. The efficient 25-hp engine, combined with standard auto-idle functionality and a maintenance-free Tier 4 Final solution, provides excellent performance and fuel economy with no additional operator involvement. There is no fuel-burning regeneration, no particulate filter to replace and no exhaust fluid to add. Simply operate as normal. A four-post ROPS/FOPS canopy provides a spacious operator environment with unobstructed sightlines of the bucket, trench, tracks and over the rear counterweight. An adjustable seat, ergonomic joysticks with proportional controls, and a pattern selector help improve operator comfort and control. The CX33C, like all C Series minis, features quick and easy access to maintenance items. Two side-by-side panels allow for convenient ground-level access to gauges, fill ports, grease points, filters and main service items.